While my young son was on spring break fairly recently, we decided to make a trip to one of his favorite places to visit—the Butts-Mehre, particularly its "museum" section, I guess it would be defined as. As he was checking out one of the plexiglass murals arranged along the walls, he abruptly asked me, and rather loudly I might add, if Georgia had "a daddy and his son" play on one of its football teams long ago. He then pointed to an image along the back wall of a rather large player and a sidekick that could indeed pass as, well, the giant's son (photo). Whether there in the museum or somewhere printed in the past, I had observed the image before, but had no clue of its background. 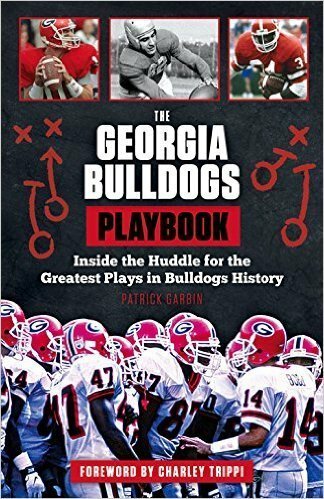 To my knowledge, the big fellow wasn't mentioned in the bible of pre-WWI UGA football, The Ghosts of Herty Field by John Stegeman. 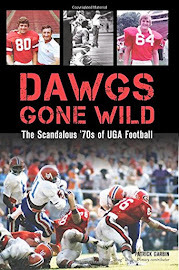 Come to find out, the same photo is featured on the cover of Loran Smith's Between the Hedges: 100 Years of Georgia Football, but there's no description of the image inside or outside the book. And, wouldn't you know, of all the murals at the Butts-Mehre, it's the one without a caption. Therefore, I was curious... What's the story behind this unusual player pairing? And, actually how big was "big daddy"? When UGA started classes for the 1903-04 academic year on Wednesday, September 16th, little Harry Woodruff and big Girard Allen "G.A." Moore were two of 76 incoming freshmen to the school. 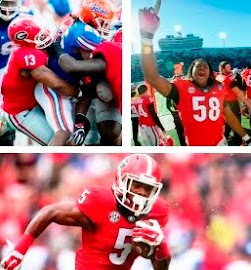 With the beginning of classes, it was reported there was "the revival in football interest" as the season opener against Clemson in Athens loomed less than three weeks later. And, with the arrival of Woodruff—a highly-touted quarterback from Columbus, Ga.—and Moore—already considered the largest individual ever on a UGA football team, and perhaps ever enrolled at the school—there was a revival of even bigger interest. There were plenty of differences between the two newcomers, most glaring of which was obviously their size. Weighing 120 pounds, Woodruff was elusive and speedy, and seemed likely to become Georgia's starting quarterback without even having taken a collegiate snap. In addition, he was already quite involved in his social fraternity on campus. On the other hand, Moore was nearly two-and-a-half times the size of his fellow freshman, weighing a staggering 275 pounds (VERY large for the time). As far as the social scene, the Greensboro, Ga. native had little time for it since he was an aspiring pharmacy student. Regarding his place on the Red and Black squad, although Moore would "easily make the team" simply because of his massive size according to a preseason report, his role would be a rather small one because of evidently a limited skill set. Entering the Clemson game, it was reported not only was the diminutive Woodruff one of the "best tacklers ever" on campus, but he supplanted Julian Hartridge, a law student, as the team's starting quarterback, as well. As far as the giant Moore, there was hardly a mention of him leading up to the season opener. Speaking of Moore's giant size, what would a 275-pounder back then be equivalent to 110 years later? Such assessment might be like apples and oranges; however, considering the average weight of the 1903 starters was 155 pounds, Moore's weight as it relates to his teammates would be something on the order of an estimated 400 to 425 pounds today. Two games into the 1903 campaign, Georgia stood at 0-2, having been outscored by Clemson and South Carolina by a combined 46 to 0. Something had to give, and for the Red and Black, it was giving the starting left guard position to the massive Moore for the all-important annual meeting with Georgia Tech. 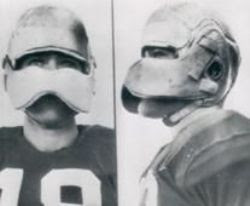 In front of a crowd of 1,200 at Piedmont Park, Georgia ran through Tech to the tune of around 450 yards back when rushing was the only method to advance the ball offensively; it wound be another three years before passing was legalized. With Moore assuredly opening large holes for the quarterback, Woodruff was the star of Georgia's 38-0 rout, gaining 180 yards on only nine carries, including a 75-yard touchdown for the contest's first score. Because of his effort against the Blacksmiths, as Tech was nicknamed then, Moore would start again at left guard for the next three games. Entering the season finale against Auburn on Thanksgiving, Georgia had a disappointing 2-4 mark and was a rather heavy underdog to its heated rival. Three days prior to the battle at Atlanta's Brisbane Park, The Atlanta Constitution ran a story regarding the new bleachers that would be erected for the game, bringing the park's capacity to 5,000 spectators. 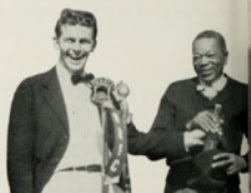 And it was there, published with the article, the curious image of Woodruff and Moore together, or "prominent members of the Georgia team" it stated. The Red and Black upset Auburn 22-13 to end its year on a winning note. At the end of the campaign, when it came to awarding letters, or "wearers of the football 'G'," just 11 of 17 team members lettered. Keep in mind, this was back when you had to see playing time—significant playing time—to be a letterman, unlike today where it's common to have walk-ons and even trainers and managers earn letters although never sniffing the field of play. For whatever reason, "big Moore," as he was called, was curiously not one of the lettering 11 in 1903, which included sidekick Woodruff. Was it size prejudice, or was the decision maker of bestowing letters stricken with short man's syndrome? How in the heck could a "prominent" player who had started most of his team's games that season not be awarded a letter? The following football season of 1904 for UGA was much like the one before. In what would be his final football campaign, the pint-sized Woodruff again starred at quarterback for a struggling team, which won just one of six games (but it was a big one). 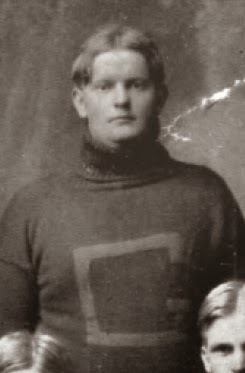 In the aforementioned book by Stegeman, Woodruff would be named by the author as second-team quarterback on Georgia's all-pre-WWI team. Along with his brother, George, he would be the namesake for UGA's Woodruff Hall—the school's basketball arena just prior to the present Georgia-turned-Stegeman Coliseum. As far as big Moore in 1904, he again started for the Red and Black along the line. However, unlike the season before when something he deserved was kept from him, Moore was finally awarded a letter. That academic year, he was also a first-year pharmacy student. Moore's whereabouts from then on is unknown, except for his passing in 1943 at 60 years old, and his burial at the Greensboro City Cemetery. Also unknown is the individual, who—at some point, likely after Moore had already passed—rightfully amended the status of the freshman football player from 1903. 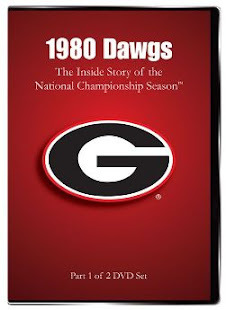 Although not even identified in the UGA football book or UGA athletics museum which bear his large image, Moore's prominence was fully and finally recognized by somebody at UGA along the way. You can see for yourself. Checkout Georgia's all-time lettermen in its football records, where it's listed that the University's original "Big Man on Campus" not only earned a letter in 1904, but was also deservedly given one in retrospect for the season before. Fascinating post. Do you know of any other players in the 270 pound plus range in the early 1900s? They had to have existed, but this is the first one I've heard of. 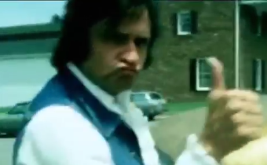 Hey, Evin. Thanks for reading and your comment. At least at Georgia, I don't know of any other 270+ players in the early days. In fact, according to GA records, the first 250+ starting players wouldn't be for another 70 years after G.A. Moore--Buck Baker and Craig Hertwig in 1973.